California Domestic Cat Rescue View other Cats for adoption. I found Oscar and his two siblings by the side of a house in Van Nuys. Their feral mother watched as I scooped up the trio and took them away to safety and to a better life. I've been their foster mom since they were a month old. Oscar hissed and spit at me when I grabbed him from under the house, but after a bath and some nutritious food he instantly became a total loverboy. If I didn't have two cats of my own I would keep him. He's a total ham, rascal, a troublemaker, and a love bug. He's the perfect kitten and I want him to go to a terrific home. 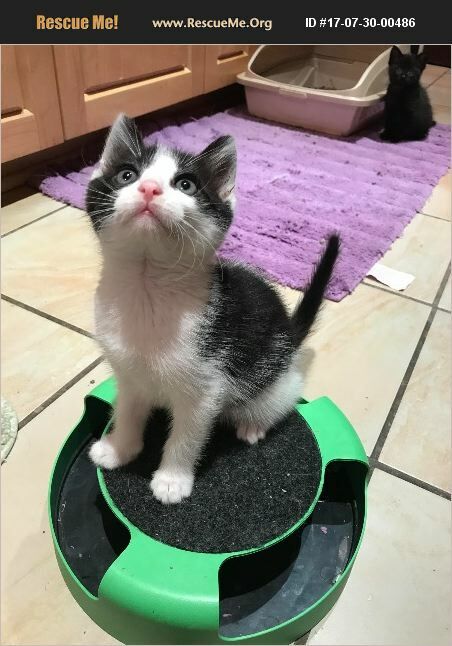 It is Www.kittenrescue.org's policy that no Kiten should be adopted alone therefore please consider adopting Oscar with one of his sisters, Lucy/Lola or another kitten. You can also have a playful dog at home. He cannot go to a home alone.